Music and lyrics taken from "The March of Women" composed by Ethel Smyth in 1910, to words by Cicely Hamilton. This copy was posted on the bulletin board of Muriel Smith's ERA office in Virginia. 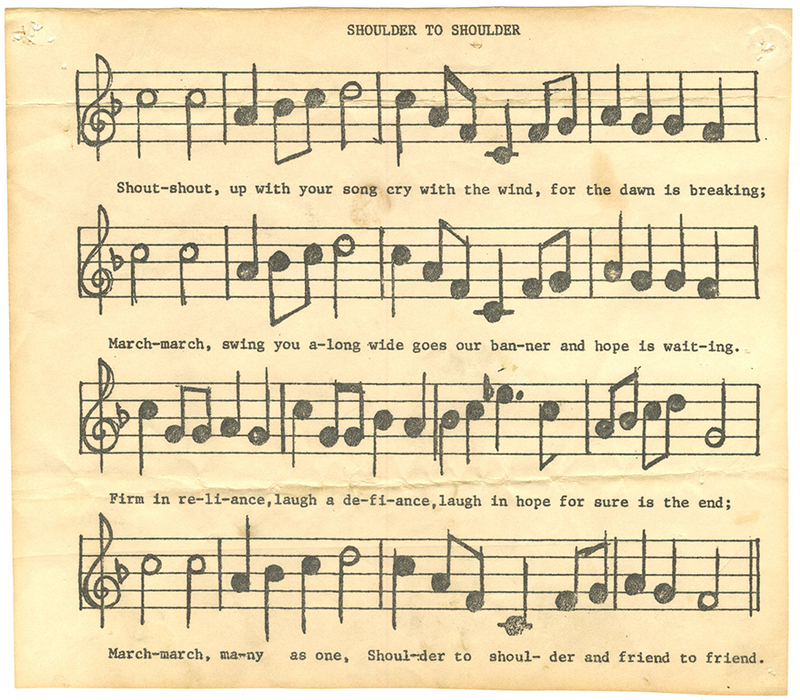 "The March of the Women" became the official anthem of the Women's Social and Political Union (WSPU) in the United Kingdom and, more widely, the anthem of the women's suffrage movement. A version of this anthem performed by the Rainbow Chorus (UK) in 2009 may be heard on YouTube. The organization that has made the Item available reasonably believes that the Item is not restricted by copyright or related rights, but a conclusive determination could not be made. Please refer to the organization that has made the Item available for more information. You are free to use this Item in any way that is permitted by the copyright and related rights legislation that applies to your use. “Shoulder to Shoulder [The March of the Women],” Social Welfare History Image Portal, accessed April 24, 2019, https://images.socialwelfare.library.vcu.edu/items/show/415.